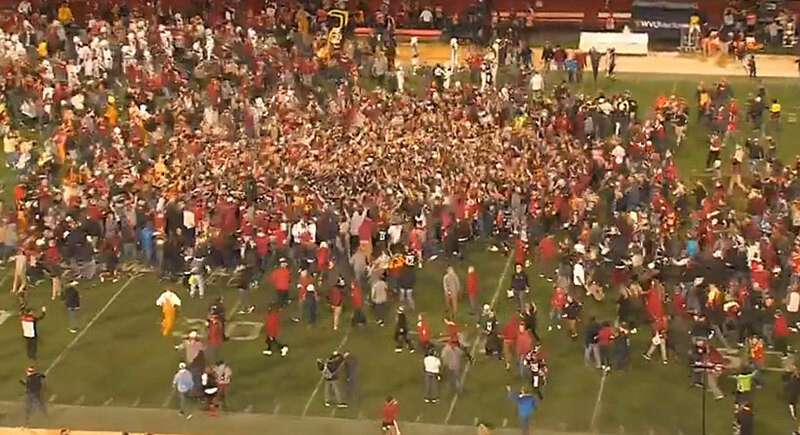 ISU has been fined after fans rushed the field following the upset win Saturday. Iowa State University’s president Wendy Wintersteen says she will appeal a find levied by the Big 12 for fans rushing onto the field after the football team’s upset win Saturday. ISU says the Big 12 Conference notified them they would be issued a reprimand and fined $25,000 for not following the school’s preestablished post-game celebration policies Saturday night. 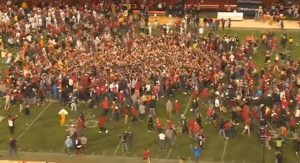 The Cyclones beat previously undefeated and sixth-ranked West Virginia University 30-14 in that game and fans rushed onto the field in celebration. A statement from ISU says school officials reviewed the actions that were taken by law officers and security staff including video provided by the Big 12 Conference and other sources and concluded that law officers and event staff not only followed all post-game celebration policies — but had also taken several additional measures to help make the situation safer.